Battery monitoring system - Elettro Service & Equipment S.r.l. With the DMU, the BMS battery monitoring unit is the other component of the Smart Battery Test. The battery data, stored during the discharge by a dedicated software, allows, after the test, to evaluate the reliability of a battery. 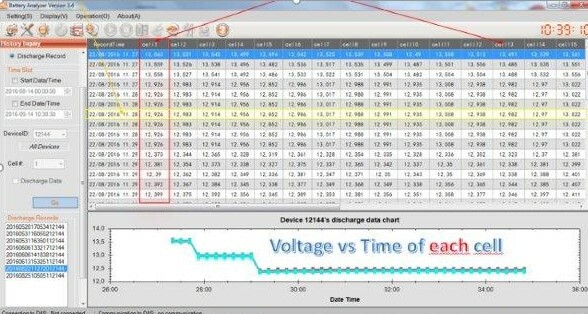 It is necessary to point out that parameters provided only by the load bank data logger, such as the discharge curve of the total V of the battery over time, don’t allow to define the efficiency of a battery. Take, for example, the following case. The first battery is efficient, while the second has a completely exhausted cell, with the risk of stoppage and explosion. 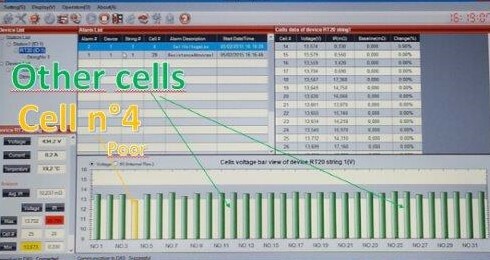 Only the measure of voltages’ equalization between the cells, shows the real status of a battery and its actual reliability. In order to collect and store all these data, it is often required that two technicians work using special PPE (face shield, insulated gloves, overalls with anti-acid and electric arc protection) and a multimeter, repeatedly measuring the blocks voltage one by one (or for equal groups). From the first to the last block, these operations will take several minutes with the current procedures. BMS now offers better results without exposing the maintenance personnel to risks, by managing and storing all test parameters automatically. It is in fact a powerful tool, able to perform lots of measures of the voltage and the internal resistance on each battery block. BMS samples all these measures simultaneously, providing, at preset intervals, extensive and accurate reports on each battery block. These aspects are important in order to obtain a correct interpretation of the data, detailed and intuitive at the same time (see Tables 1 and 2). Providing an accurate analysis, BMS is able to detect the first moment of cells degradation. You can replace a battery not only when the expected lifespan is up, but just when really necessary. Only when it begins to show real signs of decline. In other words, BMS avoids spending resources on the purchase of a battery when this might still be efficient for one or more years. Through continuous monitoring, BMS finally allows us to entrust the decision to replace the battery due to reliable data and not only because the life expectancy, suggested by the manufacturer, has come to an end. The BMS Battery Monitoring System is equipped with a touch screen display and USB connectivity, for interfacing to a dedicated software that manages and stores all data on PC.